Her family is from Spain; she was born in Cuba and grew up in Puerto Rico, which makes her a “Cuban-Rican”. Migrated to Glendale over 30 years ago, Mercy is the CEO for the Arturo Sandoval Institute (ASI) where “Save the Music” at our schools is priority. She is also deeply involved with the Glendale Kiwanis Club, as she is the Immediate Past President and Chair of Membership; Past President of Glendale Latino Association, where scholarships are awarded to Hispanic students continuing college education; former director of GAR Services; serves on Citizens Advisory Council of the Chief of the Glendale Police Department; Director of Oakmont League; and Past President of the Montrose-Verdugo Chamber of Commerce. Honored as the “2002-2003 Kiwanian of the Year”; MVCC “2002 Business Person of the Year” and “2007 President’s Award”; “2009 YWCA “Heart & Excellence Award”; “2009 CA State Senator Carol Liu Woman of the Year”;2010 Best 20 Women in Business in 20 years”, “2011 Crescenta Valley Chamber of Commerce Woman of the Year’, among others. She’s married for 37 years to Michael Velazquez, partner @ Sadd Velazquez Higashi Shammaa, CPAs and has 3 children: Michael (35), Gabriel (34) and Tatiana (29). Scott began his career in local government as an intern with the City of Monrovia in 1993, while in his senior year at Claremont McKenna College. After graduating from CMC with a Bachelor of Arts in Government later that year, Ochoa earned a fulltime position with the City. He continued to work for Monrovia during the day while pursuing a Master’s Degree at the USC School of Public Administration at night. In 1996, Ochoa earned his MPA with an emphasis in public sector entrepreneurship. By 1999, Ochoa had continued to rise through the organization and was appointed Assistant City Manager. In 2003, Ochoa’s duties expanded to include those of Assistant Executive Director of the Monrovia Redevelopment Agency, helping lead the community’s redevelopment and economic development efforts. In March 2004, Ochoa was appointed by the Monrovia City Council as City Manager. Ochoa was responsible for the day to day operations of the City, under the general direction of the City Council. During his tenure, Monrovia continued its aggressive economic development program, worked to balance quality of life issues with fiscal constraints and development pressure, and restructured the organization to meet the challenges of the rapidly changing business environment. Upon the retirement of long-time Glendale City Manager Jim Starbird, Ochoa submitted his name to be considered for the post. Glendale is seen by many as the premiere local government organization in this region. Having admired the community and the City’s achievements over the years, Scott was anxious to put his experiences and expertise to the test as Glendale City Manager. 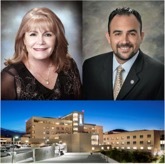 In the fall of 2011, the Glendale City Council granted Ochoa the opportunity and honor to serve the community when they selected him as the new City Manager at the conclusion of an intensive recruitment process. Over the last 24 months, Ochoa has hit the ground running by learning City operations and forging community partnerships. Blessed with a supportive City Council and an expert Management Team, Ochoa is quickly integrating himself into the fabric of Glendale. His management philosophy is predicated on exceptional customer service, values-based management, and precision execution. Scott is active in the community he serves, supporting and participating in several community groups including the Glendale Kiwanis Club, Glendale YMCA and Ascencia. He has also served as an adjunct instructor at USC’s School of Planning Policy and Development. Scott and his wife live in Glendale with their two children. Glendale Adventist Medical Center, a non-profit 515 bed acute care facility, has been part of the Los Angeles community for more than 109 years. Throughout the last century, the hospital has stayed on the cutting edge of the latest advancements in health care. Its mission is to share God’s love in the community by promoting healing and wellness for the whole person. GAMC has been able to do so with numerous certifications and awards. In a recently published Modern Healthcare survey, which published a list of hospitals with the highest and lowest 30-day risk adjusted mortality rates in the U.S., Glendale Adventist Medical Center was listed number 5 as determined by data to have the lowest mortality rate in the country. Glendale Adventist Medical Center established in 1905 is a trusted hospital serving the Glendale area and its surrounding communities. For more information, please visit www.glendaleadventist.com or call us (818) 408-8100. GAMC is also on Facebook (https://www.facebook.com/#!/GlendaleAdventist).